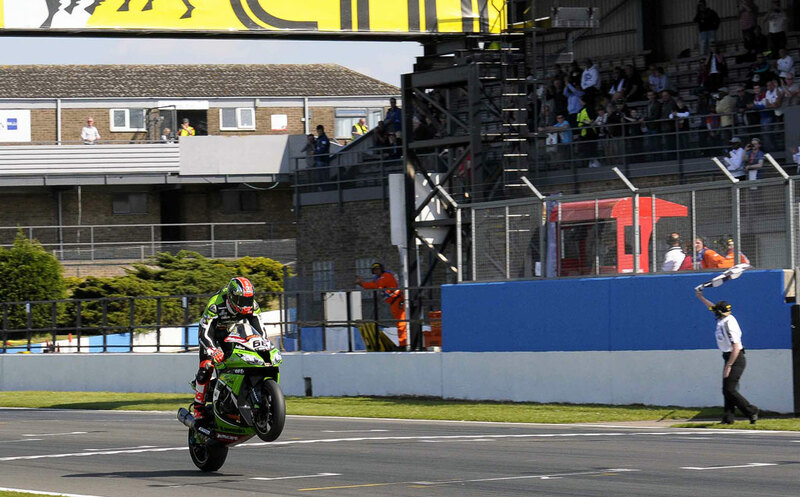 Tom Sykes had an outstanding weekend in front of his home fans, scoring a pair of wins at the World Superbike Championship round at the United Kingdom’s Donington Park. The Kawasaki racer led every session from first qualifying onwards, before leading all 23 laps in both races for the double. The double victory brings Sykes to within 4 points of series leader Sylvain Guintoli who had a decent weekend himself with a pair of podium finishes. 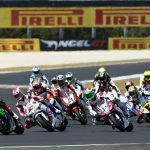 Of course, we are still awaiting the final decision on the Aprilia rider’s appeal for the second race of the previous round at Monza. As it currently stands, Guintoli has 173 points to Sykes’ 169, but if the appeal goes through, their positions at Monza would be reversed and Sykes would lose three points and Guintoli would gain back three points. Sykes took the lead from the start, with the advantage of pole position keeping him just ahead of Guintoli and Pata Honda‘s Jonathan Rea. For the first six laps it was Sykes in front with Rea close behind with Guintoli and his Aprilia teammate Eugene Laverty sitting third and fourth. On Lap 7, Laverty made a costly mistake, riding through the gravel exiting a chicane after being passed by BMW Goldbet’s Marco Melandri. Meanwhile, Guintoli continued to narrow his deficit behind Rea, finally passing the Honda rider on Lap 13 to move into second. Two laps later Rea lost further ground, getting passed on the inside by Melandri. 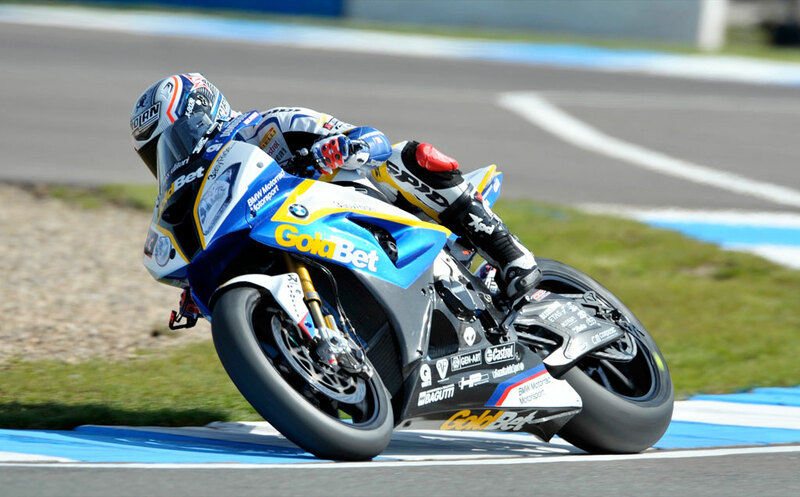 The BMW rider then turned his focus to Guintoli, passing him on Lap 17. And that’s how they would finish, with Sykes first across the line followed by Melandri and then Guintoli. The second race began with Sykes again taking the lead despite a bit of a wheelie at the start. 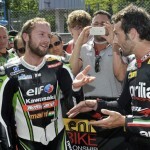 Behind him once again was the Aprilia duo of Laverty and Guintoli. Rea finished the first lap in fourth place but knew he couldn’t hold that pace. A traction control sensor failed on him during the warmup lap, limiting the power output to the rear tire of his Honda CBR1000RR. 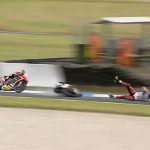 The Northern Irish racer has had a lot of unfortunate luck this season, and that continued through round 5. Sykes was already well out of reach after a few laps, while Guintoli moved into second place followed by Laverty. 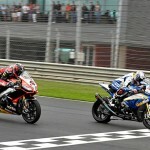 Melandri passed Laverty to take third place on Lap 18, but Laverty regained third on Lap 22. 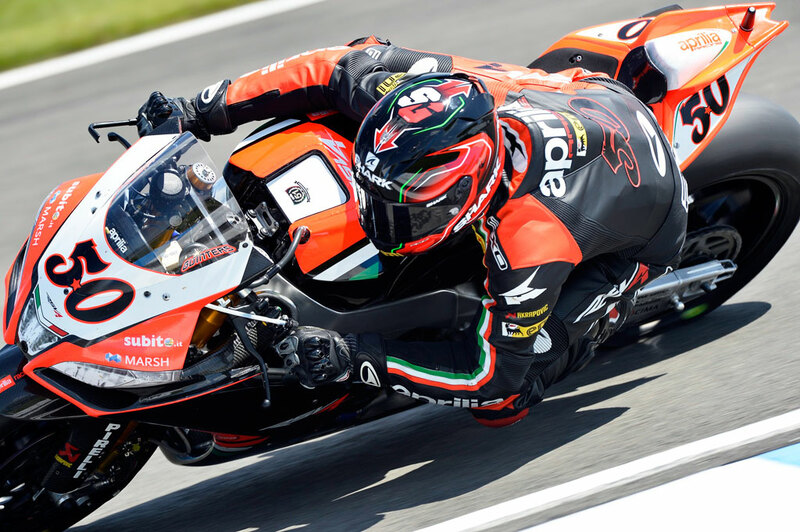 Melandri attempted one final play for the final podium spot but went wide into the grass, dropping him back to fifth place behind Althea Aprilia rider Davide Giugliano. The double victory was the first for Sykes on his home soil and the first for Kawasaki since 2000. The 2013 WSBK Championship continues June 9 at Portugal’s Portimao circuit.